I think a good majority of my readers would agree that standardised testing for young kids isn’t in children’s best interests. I think there’s been enough professionals, TED talks, viral videos and articles proving time and time again that standardised testing doesn’t measure genuine learning outcomes and at worst are harming children and the institutions that deem them necessary. The school curriculum represents a tiny subset of the skills and knowledge that are important to our society. In this day and age, nobody can learn more than a sliver of all there is to know. Why force everyone to learn the same sliver? When children are free–as I have observed at the Sudbury Valley School and others have observed with unschoolers–they take new, diverse, and unpredicted paths. They develop passionate interests, work diligently to become experts in the realms that fascinate them, and then find ways of making a living by pursuing their interests. But all around me I see parents and society standardising childhood. As though life is one big test and heaven forbid your child falls behind. 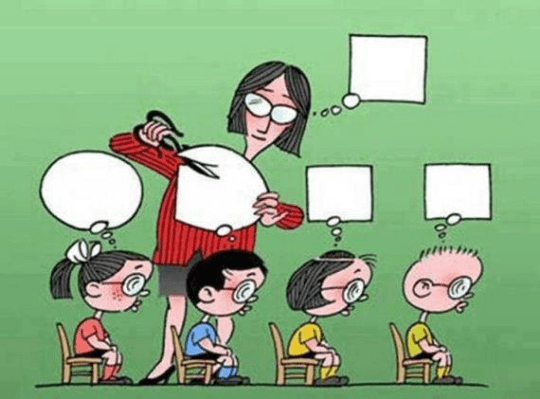 There seems to be an all round emphasis on conformity – and not just regarding education. There is so much importance placed on milestones. I think it’s unnatural and harmful to expect kids to do everything around the same time. Adults enforcing these milestones and expectations is basically peer pressure with authority. Both schooled and many homeschooled kids are expected to learn the same things at the same time and sometimes in the same way. Not to mention the way kids can’t just enjoy something for enjoyments sake and everything is made educational. Childhood isn’t a competition. There is no race, and if you want one – count me out. My kids are just where they’re meant to be. I celebrate where they are at – whether it’s viewed by others as ‘behind’ or ‘ahead’… I believe it’s neither. I don’t mean you don’t encourage them and help them to be the best them they can be – that’s part of parenting regardless. 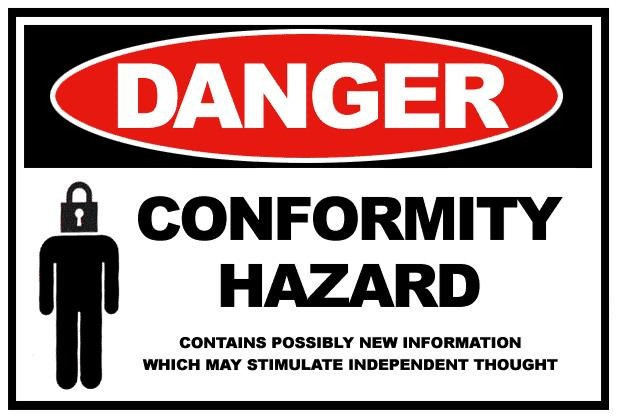 But to me it’s about forgoing the pressure to conform. Forget looking, acting, sounding, and doing the same things as the other kids their age. We, as parents and educators need to celebrate and nourish the unique gifts that every child has. The typical school model does the exact opposite to this and I think the emphasis on milestones deadens this too. [The schooling systems] fundamental premise lies in whatever unique and distinct qualities you possess being, at best, irrelevant, or, at worst, obstructive, unless they match perfectly with the knowledge that is to be assimilated. Within this framework a competitive, rather than cooperative, mind-set is fostered, as success is measured in how well you conform to the objectives presented. – Being Schooled. Kids deserve the freedom to explore what matters to them. They deserve to express themselves through their looks and what they wear. Children deserve to spend their time mastering what they find meaningful. Maybe your seven year old doesn’t care about bike riding right now. Maybe your three year old is more focused on climbing than the alphabet. Children cannot truly develop into the uniquely talented people that they are with the limits of standardised education and these expectations from their parents. It’s just as significant for them to have the time and freedom to explore things that really matter to them and their future. To play, to dream, to experiment in nature, etc. I feel that this is true of not only education but childhood itself. We need to personalise childhood. Let them be who they are without imposing your own fears and ideals onto them. Their time is not yours to dictate and your child should have a say in how they spend their childhood. My point is that if you’re internally grading your child and holding such value on milestones and conformity then it’s time to reevaluate, in my opinion. Kids are already going to face peer pressure to varying degrees so why not be the secure base in their lives who continues to support them just as they are without comparing or competing? As parents and educators, we will always have an influence on our children. What I hope is that we use that influence to help our children to discover and nurture their talents and uniqueness and not to make them fit a mold. This is it isn’t it. So much focus on standardisation and I think what we really need is the exact opposite!! How boring would the world be if we were all the same. I’m sad that the assumption is that creative learning cannot happen in schools at all- that it’s an either/or situation. We have sent our children into the ‘traditional’ education system, and so far, every teacher has been excellent, engaged, and willing to think outside the box to help our child learn in a way that suits him. We also like to think that we are the type of parents who will be active in working with the school system to achieve the best outcome for our kids- so mixing in elements of ‘unschooling’ over holidays and weekends while they also receive the benefits of the streamlined system. Mostly, I just wanted to stand a stand for the many hardworking teachers in our school system, who also read blogs and resources like this and add these elements into their classroom. It’s a rare teacher who doesn’t genuinely want to do the best they can for the kids in his/her care, and enrolling your children in traditional schooling doesn’t necessarily mean you are sending them into a harsh, cruel, tightly disciplined world of standardised tests and bullying. There are teachers that are brilliant and hard-working – I completely agree – but in my opinion they are working within a fundamentally flawed system that doesn’t give children the rights they deserve. Regardless of how great they are and how hard they try they are trying to personalise and cater to the needs and interests of a large group of children which means their is standardisation in play. 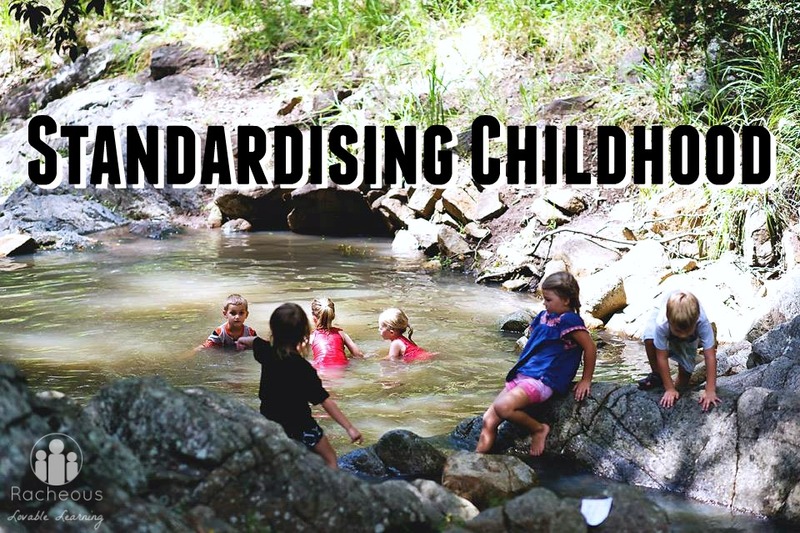 Parents certainly can play a large role – which is the point of this post – that they too can get sucked into standardising childhood. i guess this is the question i was going to ask if parent believes in basically what you are saying here what can a parent do to help a child i they are sending a child to a traditional school to help allievate the standardization the child will ultiamately have to del with?